The great forest to the south-west of the continent has long been a buffer between the ambitions of the humans of Cyrodiil and the elves of Summerset. A sea of endless green, a maze of foliage with half-hidden cities growing like blooms from a flower, the home of the Bosmer is Tamriel's garden. 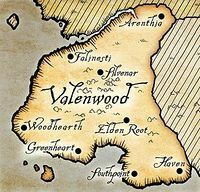 The history of Valenwood stretches back to the very beginning of recorded time: the date traditionally used as the start of the First Era is the founding of the Camoran Dynasty by King Eplear of Valenwood. The history of the land, of course, began long before the first year of the First Era. Before man or mer came to Valenwood, the forestland was a salmagundi of creatures and strange civilizations. Centaurs, hippogriffs, satyrs, minotaurs, giants, basilisks, fairy folk, hydra, and intelligent apes all flourished there before the first Aldmeri stepped onto its shores. Indeed, the first challenge for the early Aldmeri was to rise from prey to predator in the forest's intricate heirarchy [sic] of life. As the Aldmer began to change their ways to match their new environment, adapting to the forest in body and mind, they became known as the Bosmer. In return for the patronage of Y'ffre, the Forest God (either one of the old ancestor spirits or an aspect of the true pantheon), they swore never to kill, injure, or eat any of the vegetation of their new home. Eplear's success in uniting the inherently wild Bosmer must be counted among the greatest military feats in Tamriel's history. The Camoran Dynasty was itself a far different beast than the empires of man that also rose in the First Era. In the forests, after all, diversity was the law, and the Bosmer welcomed escaped slaves from the Ayleids, and then Ayleids fleeing the Alessian rebellion, and finally the new Empire itself, forming a trade treaty in 1E 340 with men who had only recently thrown off the brutal Ayleid yoke. The treaty was short-lived, however, and hostility grew between the Dynasty and the Empire as the prophet Marukh's teachings began to spread. One of Marukh's chief supporters, the Nord King Borgas, became a victim of Valenwood's infamous Wild Hunt as he traveled to Cyrodiil to urge a joint war against the Bosmer. Thus did Valenwood simultaneously defend itself and strike a devastating blow against its new enemies. Skyrim would spend the next fifty years in turmoil. Even with the eventual dissolution of the Alessian Reform of Marukh, battles continued to be waged along the Cyrodiil and Valenwood border lands. When the Empress Herda improved relations with the Colovian West, the attacks only intensified, though it was not until 1E 2714 – after unrelenting warfare and a devastating plague from the island of Thras – that Valenwood fell to the Cyrodilic Empire. The Camoran Dynasty as an entity still existed, but its power was diminished. The Empire, eager to make sure that Valenwood would not unite against its new occupiers, granted independence to each treethane of the Dynasty, so nevermore would they battle together against a common foe. Falinesti, Silvenar, Haven, Archen, Eldenroot, Woodhearth rose from being local trading posts to full-fledged powers in their own right. For centuries, the Bosmer were obedient if not particularly loyal subjects of the Cyrodilic Empire. At the fall of the Cyrodilic Empire in 2E 430, the Camorans attempted to reinstate their authority over the other kingdoms, but culturally each had drifted too far away to be united. Without any other greater power to rein in their ambitions, they began to war against one another, the Khajiit to the east, and the Colovians to the north. Valenwood ate away at itself, and offered no resistance to the coastal encroachments of the Maormer of Pyandonea. It took another outside force to reunify Valenwood: the home of the ancient Bosmer, Summerset Isle. The unified elven kingdom of Valenwood and Summerset, the Aldmeri Dominion, was the most stable power in Tamriel until the coming of Tiber Septim. The new government of Valenwood was called the Thalmor, a congress of Bosmeri chieftains and Altmeri diplomats. While not particularly popular, the Thalmor proved better than the chaos of the previous years, and endured until Tiber Septim's armies swept it away. Wisely, the Emperor allowed Valenwood to keep some of the symbols of her independence, such as the tribal councils and a figurehead Camoran king. For two hundred and fifty years, Valenwood was at peace. The War of the Isle and the War of the Red Diamond, which ravaged other parts of the Empire, left it unscathed. The Empire used the province as it saw fit, and neglected it otherwise. Gradually, the Bosmer began to grow resentful of an authority which seemed increasingly alien – perfect breeding ground for the horror which was to follow. In the year 249 of the Third Era, a pretender to the ancient throne of the Camorans appeared, and with mundane and Daedric allies, stormed across Valenwood, destroying all who stood against him. The Bosmer were slow to unite against the threat, many too terrified to stand against the Camoran Usurper and some delighted that they were being freed, however violently, from the perceived yoke of Empire. [sic] This minority grew as the Usurper's power did, and once he had consolidated his power in Valenwood, he turned his attention northward. It took nearly two decades of tyranny before Valenwood found the strength to shrug off Haymon Camoran's rule. When he lost his seat of power, the Usurper's conquests in Colovia and Hammerfell rose in revolt, and his army was destroyed in the Iliac Bay between Hammerfell and High Rock in 3E 267. The Valenwood the Usurper left behind was a broken land. No longer trusting the Empire or Summerset for support, or its local leaders for guidance, the Bosmer have become more and more isolationist in temperament. The people began leaving the cities, preferring life in the forests, returning to their earliest traditions. It is not surprising that when the province showed signs of weakness, its rapacious neighbors chose to attack. No other province suffered more during the Imperial Simulacrum than Valenwood. With the Empire unwilling to lend its assistance and defend her, the land was attacked from the east by Elsweyr and from the west by Summerset Isle, both taking sizable chunks of the Bosmeri land. The political weakness of Valenwood has been evident for more than twenty years now, and the Bosmer seem resigned to this state of affairs. The land is considered by most to be a mere geographical designation without any political purpose. If there is honor or pride, it is with one's family or clan. National feeling, never strong, seems to have died. The tribal council has not met in decades. Valenwood appears to be adrift. And yet there are signs of other forces stirring. The Wild Hunt has been sighted for the first time in over five hundred years, although to what purpose is not yet clear. Falinesti, the "walking city" of trees, has rooted itself for the first time in recorded history. A new Bosmer prophet has arisen, known only as the Precursor, who preaches that the old Forest God Y'ffre is returning with new gifts for his favored people. Whether these are isolated events, or signs of some great change coming to Valenwood, remains to be seen.